Chelsea Gems are lusciously dressed in clove infused gin, pluot relish, and amaranth. Photo courtesy: Chelsea Farms Oyster Bar. Chelsea Farms has held its position as a passionate family heirloom since 1987 when Linda and John Lentz started their adventures in sustainable shellfish farming. Being raised in an environment with organic gardening and fishing, it is no surprise that Shina Wysocki and Kyle Lentz share the same values and goals for their new business to come. The Chelsea Farms Oyster Bar will be located in the 222 Market Place in downtown Olympia, a forward thinking one-stop business incubator. Wysocki and Lentz have clear and focused plans to expand on their community’s knowledge of the clean and charming seafood residing within miles of Olympia. 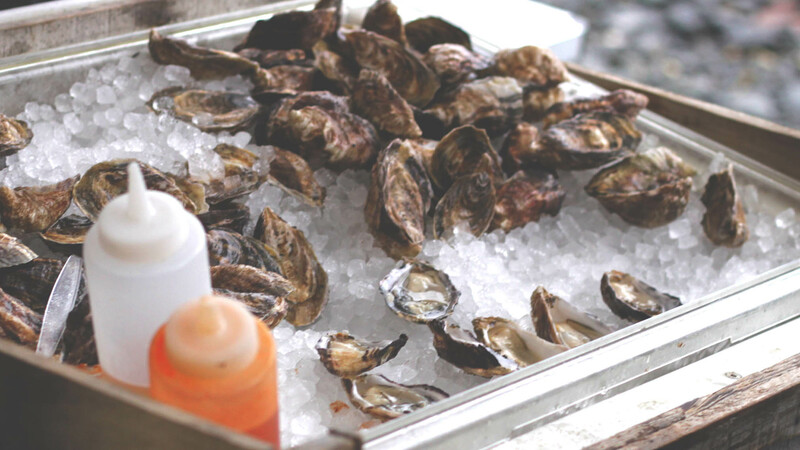 Chelsea Farms is a member of the Pacific Coast Shellfish Growers Association, so naturally water maintenance is an important factor while growing their Chelsea Gem, Bonita, and Olympia Oysters, along with their fresh clams and geoduck. Education on the water and where their seafood was sourced from is essential to the dining experience. 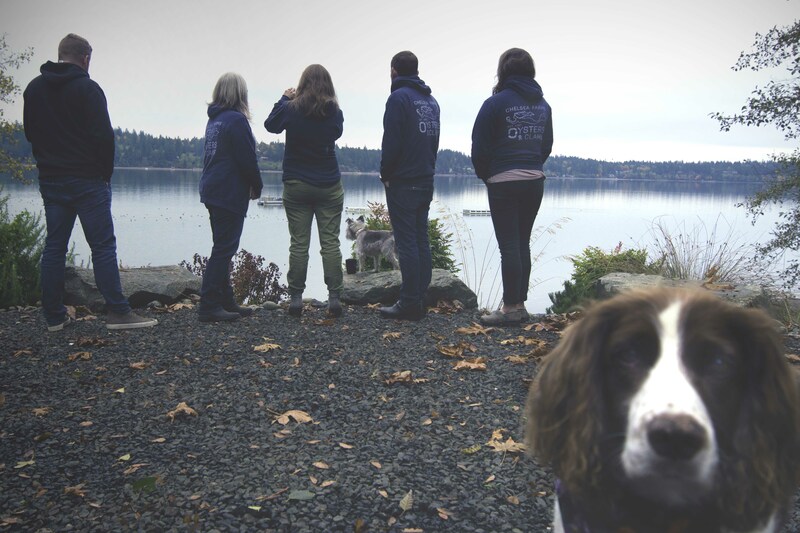 Chelsea Farm is a family-run business, including their rockstar sidekick, Chelsea. Photo credit: Kailey Caldwell. Chelsea Farms Oyster Bar will be focused on highlighting the diverse species of shellfish in the South Puget Sound. 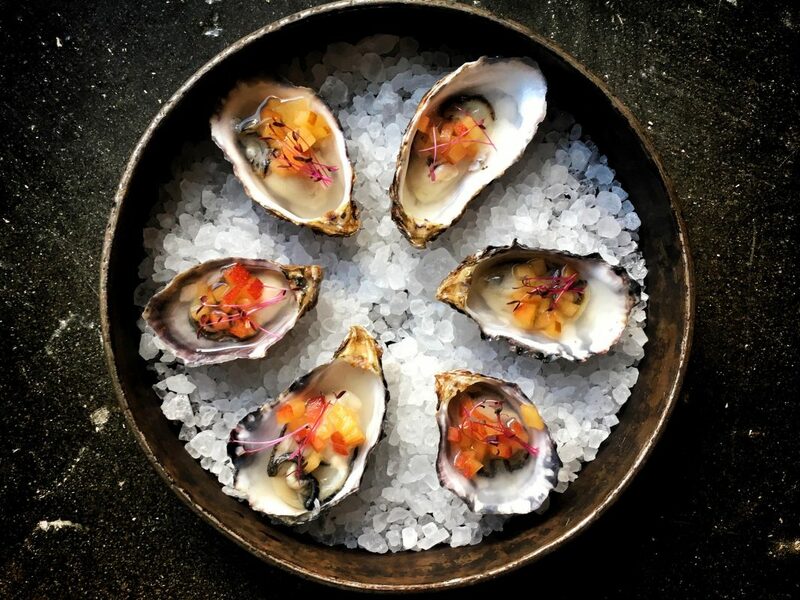 The bar will keep a rotating selection of different South Sound farm’s oysters, so guests can enjoy the unique “meroir” that is home to each individual farm. Meroir is a notion that plays on the same science behind terroir, only applicable to the sea and the way a shellfish is harvested. A good example of meroir is in The Chelsea Gem, a Pacific Oyster grown on Eld Inlet. This petite beauty is tide tumbled, a technique in which the oyster is grown and tumbled in bags suspended by buoys in the water. This creates a completely new flavor profile that is clean, sweet, buttery, and a touch briny. These Chelsea Gems go quick during a fall beach party, with an heirloom tomato cocktail sauce and house mignonette. Photo credit: Kailey Caldwell. Chelsea Farms plans on reintroducing a “fresh approach to the raw bar in South Puget Sound, thoughtfully producing each dish with intent and purpose,” Wysocki says. Kathy Hubler, head of the bar program, is focused on “delivering the best of the best, with classic cocktails directed toward the flavors of each oyster.” The endless pairing options of wine and cocktails contributes to the celebratory, innovative, and reflective environment the bar is aiming for. 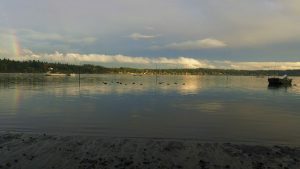 A shy rainbow greets Eld Inlet and the tide tumbled Chelsea Gems. Photo credit: Kailey Caldwell. Hubler will keep a reserve bubbly list on hand, including half bottles for the casual diner and full bottles for any occasion. Executive chef, Austin Navarre, has a vast culinary background with a heavy Asian cuisine influence. Navarre plans to source from local farmers, keeping his menu consistently seasonal and rotating. This ever-changing menu also includes the oysters themselves as well as the colorful array of garnishes and accoutrements they will be dressed in. 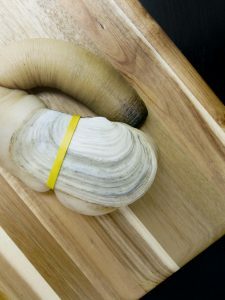 Geoduck will also be a continued feature of the menu coming in various forms, such as crudo, fritters and kimchi. Wysocki and Lentz are very excited to share this experience with Olympia’s growing downtown community. Most of all they are thrilled about their team members, from the farm to the business, “the caliber of the team is pretty great. There is talent in Olympia and timing in downtown is good,” Lentz says. The oyster community is rapidly growing stronger every day, oyster blogger Julie Qiu has created an “oyster passport”, a user friendly tasting journal for these delectable little specimens, and will be available for purchase at the new bar. This journal helps maintain the excitement and pleasure of tasting excellent local foods, perpetuating the idea of dining as a communal and merry event. 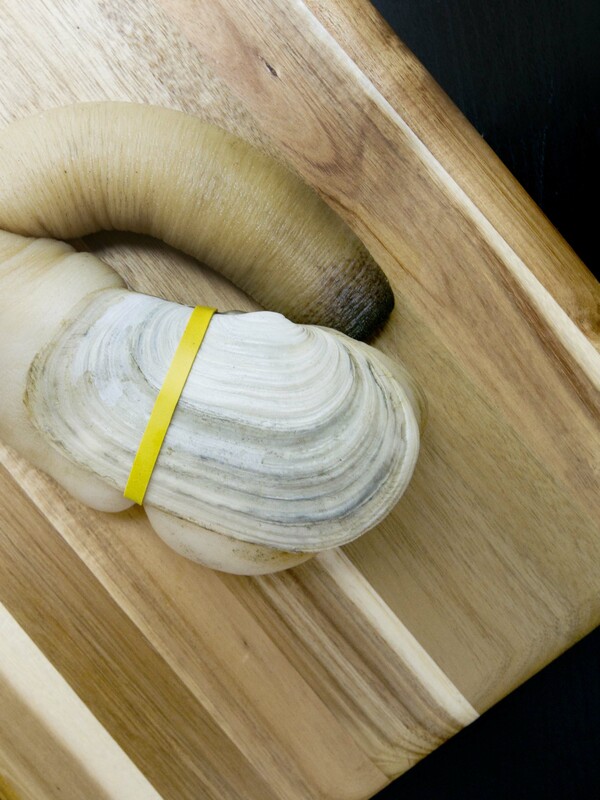 A geoduck from Chelsea Farms is cleaned and ready to be prepared for a feast. Photo courtesy: Chelsea Farms Oyster Bar. rom the beach to the bar, the many minds involved in Chelsea Farms Oyster Bar are highly intuitive. They are continually developing delightful provocative presentations of Pacific northwest seafood, bringing together all-season farmers, playfully creating festive concoctions, and harvesting energy that is given back one slurp at a time.